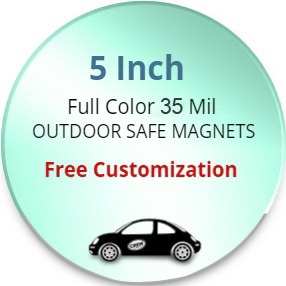 A 5 inch outdoor safe circle custom full color magnet is best suited for those advertisers who wish to say lot to their customers. This magnet reflects a good view when affixed over the car door and car hoods. Also, it is best suited for advertising any kind of product. Advertisers working on small budget can always seek it because they have to shell out just $0.69 - $0.26 towards customization.